Does this word encourage your heart today? If so, please leave a comment below. I’d love to hear what the Lord is saying to you! Loved the story of the eagle. I am in a lonely place and am actually losing eyesight in one of my eyes. I have prayed for this eye and not given up, but am mostly just living in gratitude for my better eye. I am still waiting for my miracle! I am in a very stressful situation at home and with family. The doctors even say that stress is what caused my vision problem. I would love to be restored as that eagle was! Father, thank You for removing every barrier to give us full access to You. Thank You for Your shed blood that has forever changed who we are as we come to You, joint heirs, sealed with Your precious, powerful Holy Spirit. Thank You that today Jan encouters You in a new way, that just as You strengthen and sharper her spiritual vision, You restore, strengthen and sharpen her eyes, her physical vision. Let Your peace so saturate her heart that she can be still and know that You are with her, and for her. Speak direction in her heart and shine the light of wisdom before her. Keep her family even as You unveil more of Your purpose for her life. I praise and glorify You in advance for the completion of what You began in Jan. Now, reward her faith in the midst of these trials. Rescue her swiftly and completely in Jesus’ name, it is so. Great insight i’ve for these two weeks felt heavy and uneasy to flow in prayer, from this massage am picking up in Jesus’ name.May He richily bless you. Thank you so much for your obedience. I thank God for you and ask a special blessing for you. This word speaks to my heart. I have been praying for restoration and renewal. Thank you Jamie!!! Thank You so much for this lesson. I love the eagle vision, it brought the whole prophetic lesson together. I have gained new insight and new energy! Thank You again for being obedient to God. God Bless You! Thanks Jamie for allowing our Father to use you as a powerful encourager! May the Lord continue to bless you with fresh fire to be a blessing to many. WOW! This is mine today! God gave me the Eagle 13 years ago on my Emmaus walk as a guide from Him. Today, these words are so right on target for where I have been lately! Thank you Abba for the reminder! And thank you Jamie for sharing this. In the name of Jesus, Hallelujah! Thank you so much Precious Friend and Sister inthe Lord ! I so needet this! I felt so lonely , so discouraged , and i did not feel the desire to pray ! And it is strange for me to ever feel this way ! So i could so see myself looking like that Eagle ! Now i prayed to the Lord for new strenght and he gave me the verse from Isaiah 40:31 !And this is a answer to that prayer !! All Glory be to God !!! He who is who was and is to come!! The Lord is Mighty in fact he is Allmighty All powerfull Everlasting God !! He is the Alpha and the Omega He is the Beginning and the End ! He is GOD!!! Hallelujah!! Thank you so much dear Sister for being obedient to the voice of the Lord !! I pray for increase of Gods blessings in all areas of your life, in Jesus mighty Name!! Yes! Yes! This is exactly how I have been feeling for months. Thank you Lord for never forsaking me. Hallelujah to our Almighty God! Thank you Jamie for your obedience to the Holy Spirit in sharing this timely word. May the blessings of God pursue and overtake you. Good morning, I want to say thank you for allowing the Lord to speak to me through you..ive been feeling like this and battling it for a few months now..and I pray to God everyday to take me back to that connection with him..it seems to be a lot of noise and chaos in the world I’m living it..Thank you God bless you …every morning I read your blog posts.. Thank you, I have been experiencing a burned-out period spiritually specifically as I have been pouring g an overwhelming amount of energy in to a now job role. Thankyou for “writing the vision and making it plain so that he who runs (me) can read it. ” Habakkuk 2:2 and be encouraged from God. In my case running=giving all that extra effort to work. Always so timely and encouraging! Thank you. When do you think you might do the Supernatural Phenomena webcast? Looking forward to it. Jamie, I really needed this one today. You are always on time. I thank God for you to keep me encourage. May God bless you and your family and ministry. I feel that I am in that space, I felt alone in a dark place where the devil was excited laughing at me. It was a hopeless situation, one unresolved problem after the other, difficult to read the Bible , to pray and fasting was even more difficult, but God was there in the darkness, even this post I believe is His continuous work in me. Thank you Jamie, may God increase you. Thank you so much for this. Without going into unnecessary details I was deeply wounded by the Church of my city. 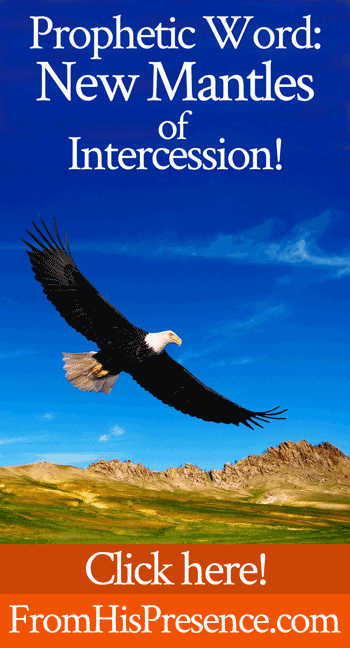 Just been through some serious healing prayer and in the last couple weeks feel like I have been freed to interceed again. This confirms exactly how I have been feeling. I went through a period where I could barely lift my head to pray and as I late I know in my spirit that I am now praying from a place that I have yet to pray from before. Glory to God in the highest as my hearts cry is to display His splendor on the earth. I personally know this word is for me. I had all but barely been able to pray recently. But the Lord has had me in deep repentance and restoration this last week. When I read this word I knew it was for me. Beloveds, how God loves us! Thank you Jamie, always. Blessings upon you and yours! Oh, thank you so much mighty God, for a powerful revelation, your hand Oh Lord is not short to touch , nor is your eyes blind to see & that you are forever true to Word. I already hear your voice, oh Daddy so loud and clear with so much Love, saying, do not fear, I’m an your God , the only God, beside me there is none! When you go the waters I will be there! Great blessings upon your daughter ,& family, give her wisdom, daddy to see more and share with us Lord! Love you lot Jamie, God richly bless!! The eagle has always been a particularly strong and encouraging symbol for me! So how crazy is it that my name Yolanda in Hawai’ian (I’olana’a) means “To Soar as with the eagles!” I love how Daddy God Blesses me with little things like this! ?? I have been feeling a bit worn and weary. But I do believe that it’s God’s time for me to come up higher with Him! This is such an encouragement to me! Hallelujah! Above is like talking to me, but also I can testify that the Lord is renewing and restoring me. A great encouraging Word for me. Thank you Jamie. Dear Woman of God and Handmaiden of the Lord, thanks for your weighty prophetic words released through you from the Lord! It truly blessed my heart as I read it today! Truly I’ve been feeling all those things and more and been in a fierce spiritual warfare battle. But Father God told me to speak VICTORY over my life and that of others so I am! May all that the Lord has spoken been accomplished in our lives and even greater things, all for His glory and the salvation, healing and deliverance of all people!!! The best is yet to come in 2019 as we SEEK HIS FACE !!! I am so much blessed and encouraged. Thank you so much for always sharing what the Lord had spoken to you.